Should an Association Retain Photo ID Cards? Asked – Our HOA makes us take a photograph which they put on an ID card to use at the various amenities on site. Upon move out, they make us turn in the IDs. I found out that they don’t destroy the cards that have our name and photograph and what unit we are in. The HOA keeps it in the “unit file” in perpetuity. I don’t feel comfortable with this, but I turned mine and my husband’s in to avoid paying $25 each for not handing them in. My step-daughter has lost hers and I’m being charged $25. In finding out the fee does not go to defray any costs incurred by the board. This does not sound legal/in-line with privacy laws. Suggestions? 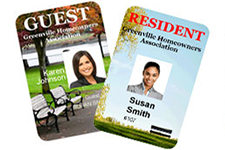 Answered – The HOA’s practice of retaining photo ID cards does not violate the law; however, the ID cards do not contain information that HOA’s are required to retain as HOA “records” such as copies of the HOA’s governing documents, minutes, financial records, and litigation files. There is no arguable reason for the HOA to retain photo ID’s of past members, so it would be our recommendation that rather than retain the photo ID cards the HOA shred them once they are surrendered, thereby preventing any opportunity for misuse of the information and photographs contained in the cards. The charge of $25 for members who fail to turn in their ID cards upon moving out of the community is probably a penalty charge listed in the HOA’s Fine Schedule. As a fine, the charge is not required to be used to defray costs incurred by the HOA, but is a penalty designed to motivate members to surrender their cards, so they are not used for entrance to the HOA’s amenities by unauthorized individuals. The amount of the fine is not “unreasonable,” so it does not violate the Civil Code that governs homeowners associations. Content provided by TLG attorney Terri A. Morris, Esq.